The sequel to Chamber Strings I offers all-new articulations and sonic subtleties for the small string ensembles. Chamber Strings II contains many of the playing techniques in the first Collection, but played “con sordino” (with mutes). They lend themselves well to soft, intimate arrangements, and provide nuanced variations to your orchestral palette. The Chamber Strings II collection offers various facets of short and sustained notes, crescendos and diminuendos, but also includes our unique Interval Performances, including legato, portamento, and trill performances. 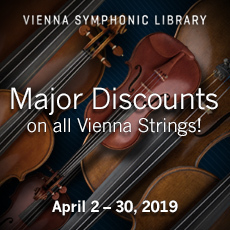 All of the recorded samples were performed by an accomplished ensemble of string players who have been lending their talents and their international experience to the Vienna Symphonic Library for years. This collection reflects their mastery over their instruments, bringing the art of chamber music alive in your personal studio.